The rain that has disrupted the rally since last Friday in Bolivia continued to play havoc with the planned schedule. Before the stage, race direction announced there would be changes to the day’s program because of local flooding and rising water levels in rivers that they had to pass. While the first half of the timed special was completed, rally organizers were dealt another blow when there was a massive landslide on the liaison road some 40 km north of Jujuy, and 16 km from Salta, said by the Argentinian civil authorities to have caused considerable damage to a village along the way. 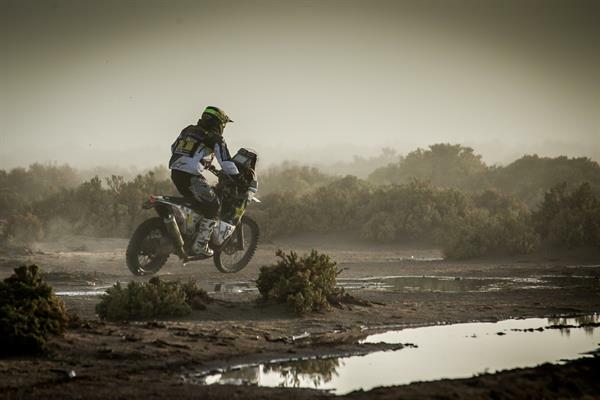 The leading group of riders managed to complete the stage, but many of the remaining field, and most of the support teams and vehicles did not reach Salta before nightfall. Dakar vehicles, competitors, assistance and logistics were diverted over an alternative route, extending the liaison by about 200 km. The late arrival of riders and vehicles, some of which were not able to reach Salta in time for the start of Stage 10, caused race direction to cancel Wednesday’s stage nine. Teams and vehicles will now regroup in time for the tenth stage on Thursday, which will go from Chilecito to San Juan. The cancelled ninth stage, the so-called ‘Super Belen’, planned for almost 1,000 km, and with very difficult navigation, was to have been a possible game changer in this year’s rally. The cancellation also cuts back on Quintanilla’s possibilities of narrowing the almost 21-minute gap in the overall standings to current race leader, British rider Sam Sunderland. He now has about a seven minute overall advantage over third placed French rider Adrien Van Beveren. Renet wrapped up the stage nine minutes off the fastest time in eighth place and stays in seventh overall. He is now within shooting distance of achieving his goal of being at the finish on Saturday among the top ten finishers. Despite the cancelation of Wednesday’s stage, Thursday and Friday still represent two long and very difficult days, and while riders only contest a short 64 km timed special on Saturday, they still have a total final day’s ride of 786 km to reach the finish line.